This is the Polaroid 100 Land camera and it was Polaroids first pack film camera that was mass produced with and automatic shutter in 1963-1966. I picked this camera up at Todd Farm Antiques Show and Flea Market for around $35 USD that came with its original leather case and a bunch of goodies. Now this isn't my first land camera, but this is by far my favorite one so far because of the rangefinder and the glass lens. So far i have put two packs of film through it and it works like new. 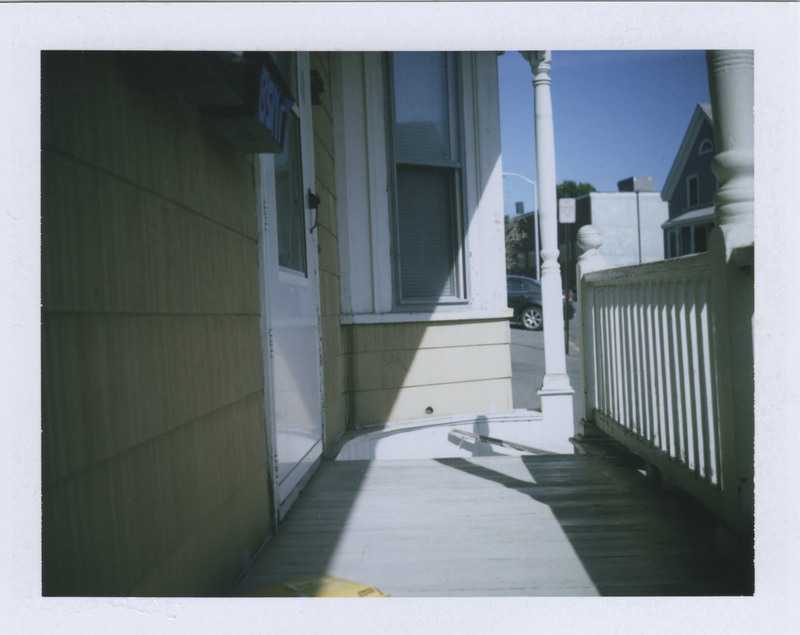 The Polaroid 100 has a lot of great features that I didn't have on my other land camera. The 100 has a Rangefinder focusing system which is fantastic and then a fame line window for composition. So you have two windows to look through before taking a shot, which sounds like a pain but trust me its not that big of a deal. The camera has a 114mm /f8.8 3-element glass lens that is extremely sharp, and just like the Leica Mini I brought it for that reason and among other reasons, because the other land camera I have is a 210 that is a plastic lens that uses a distance focusing scale that is accurate at times but not always. Now the shutter is automatic and has shutter speeds from 10 seconds to 1/1200 of a second and is aperture priority but the great thing of this camera I think is the Scene Selector. With this it gives you two different apertures for each film speed which is extremely helpful in tricky lighting situations since the automatic exposure eye of these cameras does get fooled easily but i haven't experiences that with this camera yet. You have quite the choices of ASA speeds 75, 150, 300 and 3000 but for the most you fill be using 75 or 3000. Also you have the light and darken wheel which is the cameras exposure compensation with a range of -1 to +2. One of the other reasons buying this camera is the tri-pod socket on the bottom of the camera which will come in handy with longer exposures and group shots with use of the timer or a friend, but unlucky me my kit was missing the self timer. Lastly the camera is completely made of metal so it weighs a ton but its made like a tank and i would take this over its plastic bothers and sisters any day. The Camera came with some accessories that I though I would talk about about that are great aids to the metal land cameras. Fist off the camera kit came with two packs of film one from 1969 that was open and I decided to try it anyway knowing that it wouldn't work because i didn't know how it was stored but to my surprise it worked ! So I shot that entire pack and I'll be saving this one for a while, but with the older black and white Polaroid film you have to coat the prints and this film being 46 years old I thought the coater chemicals would be dried up as well but surprise again it wasn't and i coated the prints so they wouldn't fade. I would recommending wearing gloves when handling this chemistry from so long ago and i would do outside or in a well ventilated area. The second goodie that came with it which i was happy about is the Polaroid Portrait Kit, which is an set of goggles that goes over the viewfinder and a small lens that that goes over the camera lens. No this helps getting closer for portraits that changes the minimum and maximum focusing to 19-42 inches. The last goodie here is a black and white cloud filter, which is basically a contrast filter that helps her sky and cloud detail in black and white pictures. It covers the camera lens and the electronic eye as well. Also a few goodies that i didn't picture where the case because its pretty beat up and I'm trying to air out due to the old smell! It also came with a flash that was badly corroded and it came with a bunch of picture mounting boards. Now this is something that I recommend doing to every land camera you ever own for a few reasons. Now when i got this camera that had an old 4.5 volt battery in it that exploded and turned to dust filling the compartment. I took the camera outside and put the battery half in a ziplock and dumped the dust in to the bag as well as the old battery(which i believe it was the original battery that came in the camera) and them i cleaned the compartment with lysol, but i really recommend rubbing alcohol. Since this takes a 4.5 volt battery I bought a small flashlight that takes three triple a batteries and took the batteries and the battery holder from it and taped the camera battery ends to the connectors and it worked like new! Just to keep in mind this is the lazy way too do with battery conversion because the electrical tape isn't permanent and might come loose or unstick after a while. But if you feel ambitious and want to premanently make it take 3AAA batteries I recommend looking at Option8's battery conversion that I will later do, but for now this works for me. All things considering this has been a fun camera to use and shoot and thats what it's all about. I would say that I would recommend this camera for a few reasons. One is the glass lens and the rangefinder but if you want a better rangefinder and no double viewfinders Get the 250 that has the Zeiss Ikon Rangefinder (Zeiss is nice!). Also the two aperture setting per ASA setting is quite handy in tricky lighting situations. And finally the fact that it is metal, even though it weighs a ton, it doesn't feel cheep at all and it will stand up to anywhere you bring it . Is this the best Land Camera to get? No, not at all, that could be the 180 or the 195 but thats just my opinion ! But for me I love the 100 and its a blast of a camera and i will be carrying this guy around with me at all time this summer. You can pick one up on eBay for around $30-100USD depending on condition and if it comes with anything. If you guys have and questions or comments feel free to as below or email me ! thanks for reading !